When it comes to crafting the perfect pour over, finding the perfect water kettle is a must. 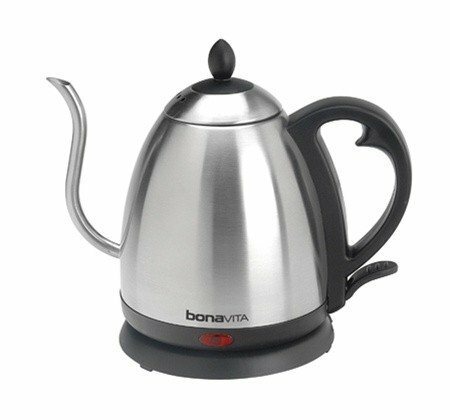 The Bonavita Electric Pour Over Kettle boils water and pours it right from its curved spout, making you feel more under control when it comes to water flow. Featuring a one-liter capacity, the Bonavita Electric Pour Over Kettle heats water fast via its stainless steel heating element, then shuts off automatically when your water is ready. Goose-Neck Spout - The Bonavita Electric Pour Over Kettle features a goose-neck spout that's both elegant and great for pour over creations. Auto Shut Off - Once your water is ready, the kettle will shut off automatically. This spout that is specifically made for pour overs works great! Who Supports the Warranty: Bonavita. Warranty covers manufacturer defects only, carafes are not covered unless they arrive with cracks or defects. Rinse with warm water after each use.